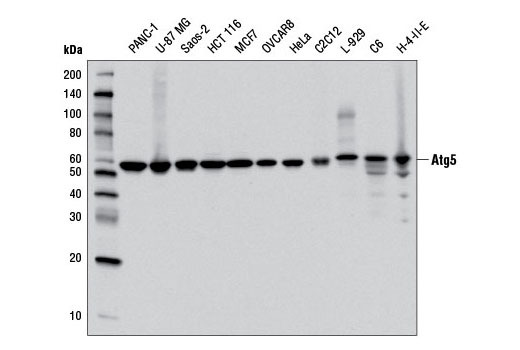 Western blot analysis of extracts from various cell lines using Atg5 (D5F5U) Rabbit mAb. Western blot analysis of extracts from wild-type MEFs (wt) or MEFs from Atg5 knockouts (Atg5-/-) using Atg5 (D5F5U) Rabbit mAb (upper), or β-Actin (D6A8) Rabbit mAb #8457 (lower). Atg5-/- MEFs were kindly provided by Dr. Ramnik Xavier, Massachusetts General Hospital, Harvard Medical School, Boston, MA. Immunoprecipitation of Atg5 from PANC-1 cell extracts using Rabbit (DA1E) mAb IgG XP® Isotype Control #3900 (lane 2) or Atg5 (D5F5U) Rabbit mAb (lane 3). Lane 1 is 10% input. 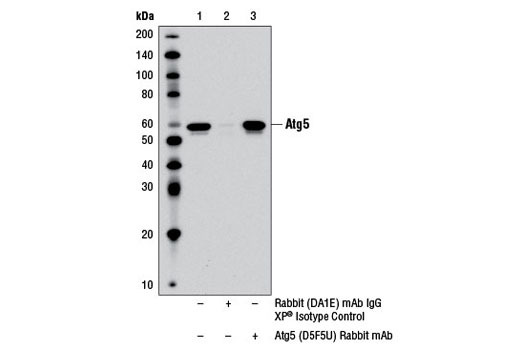 Western blot was performed using Atg5 (D5F5U) Rabbit mAb. Mouse Anti-rabbit IgG (Conformation Specific) (L27A9) mAb #3678 was used as a secondary antibody to avoid cross-reactivity with rabbit IgG. Atg5 (D5F5U) Rabbit mAb recognizes endogenous levels of total Atg5 protein. 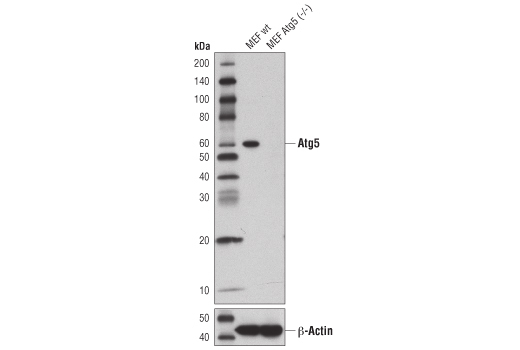 This antibody is capable of detecting Atg5 conjugated to Atg12. Monoclonal antibody is produced by immunizing animals with a synthetic peptide corresponding to residues surrounding Leu265 of human Atg5 protein.